Famed for his high-energy performances from 15 years fronting The Stranglers, and his coincidental uncanny resemblance to David Bowie, Paul brings these fabulous songs to life and with his band of leading British musicians, moves seamlessly from one era to the other. 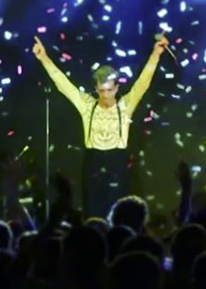 It's the kind of evening described by Bowie himself as "…a t-shirt and jeans type of show…". The extensive repertoire highlights Bowie's amazing musical depth and knowledge, including hits such as: China Girl, Rebel Rebel, Sound and Vision, Fame, Suffragette City, Scary Monsters, The Jean Genie as well as classics Life On Mars, Ashes to Ashes and many more. The show is all about the music & in contrast to many modern day 'tributes' - no wigs or posturing - just a great evening of Bowie's music, delivered faithfully & passionately. Paul Roberts' homage to Bowie is a unique celebration of this iconic artist by one of the best in the business. The show has received rave reviews from as far as Malaysia and Singapore and of course at home here in the UK, (see our testimonials), fully endorsing that BowiePR is a live experience not to be missed.